developed in alpine style as a ski resort. 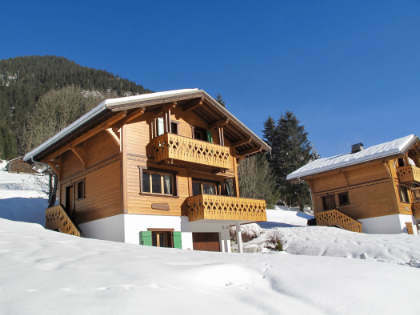 Chalet Dow is a Family Run business for families and groups of friends in the Portes du Soleil. 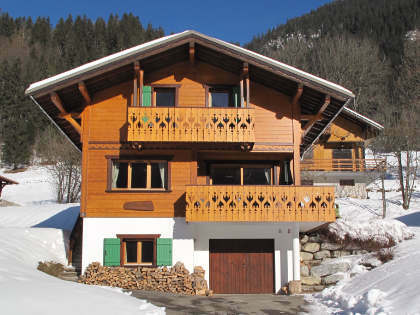 Home from home accommodation for eight people in four bedrooms, Chalet Dow is five minutes drive from the nearest lift station. 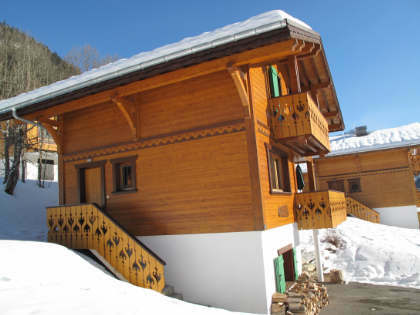 A traditionally built three floored wooden chalet with balconies on the first and second floors, the first floor balcony gives access to a wooden terrace with table and chairs as well as a bbq. The fully equipped kitchen, with dishwasher, fridge freezer, microwave and programmable oven makes catering for a group of eight hungry skiers a pleasure and the open plan layout of the main floor means that the cook and their helpers won't be left out of the chat. Those not involved in cooking can light wood burner and browse the DVDs. All bedrooms have plenty of wardrobe space so the "going out" stuff will look it's best when needed. Two hairdryers and iron and ironing board are available to help complete the look. The bunk bedroom, with a second TV and XBox 360 and more floor space for sprawling, becomes a natural children's room. For those wanting a quiet forty minutes, the internet can be accessed from all rooms by WiFi. 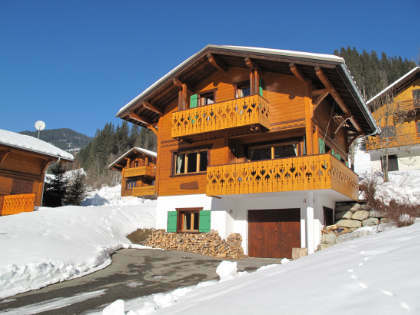 Chalet Dow is on a private road with only an occasional car or two coming by so very safe for children. In summer, we have had a badminton net stretched across the road with a court drawn on the tarmac. We only had to stop play twice in a morning's competition to let a car through! As well as ski storage, the garage has a "Baby Foot" table for your use. 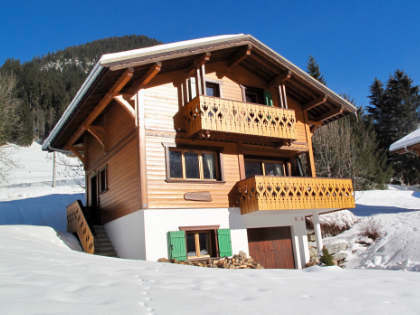 Chalet Dow is one and a half hour's drive from Geneva Airport and nine hours drive from Calais. There are six stations nearby in all from which to access the ski areas of Chatel, Morgins, Avoriaz, Morzine and the rest of the Portes du Soleil's 650km of pistes. To see what Chalet Dow has to offer in the summer, click on "Summer Activities"